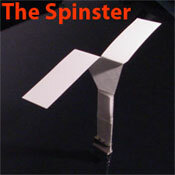 The Spinster is really an auto-gyro. It is thrown high into the air, and as it falls the air rushing past it's 'wings' in opposite directions causes it to rapidly spin, slowing it's decent. 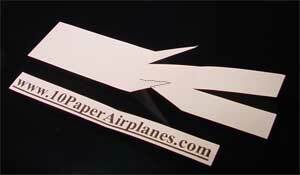 To make this paper airplane you will need a single sheet of paper, a ruler, some tape and a pair of scissors. 1. 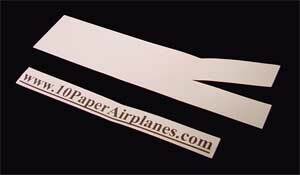 Using a ruler, mark a piece of paper every two inches, and then cut it making 5 two-inch strips and 1 one-inch strip. You will need 1 two-inch strip for each Spinster. 2. Using the scissors, cut a 2&1/2 inch strip down the center of one end. These will be the wings. 3. Cut small slits down each side, beginning where the first cut stops, and moving inward 1/2 inch on either side. This will be the taper down to the body. 4. Fold the two pointed strips down towards the bottom, then fold each side of the bottom in towards the center, and finally, fold the very bottom-most 1 inch of paper back up and tape it in place. 5. Fold the wings down so they are parallel to the ground and you're done! 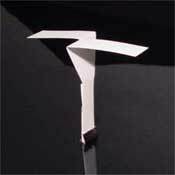 To throw your Spinster, fold it's wings down and throw it straight up as far as you can. 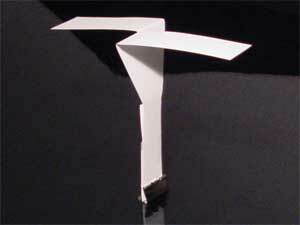 Try folding down it's wings and placing it inside the crease of another paper airplane, so when you launch the plane it will eject the Spinster higher than you could normally throw it!